Google has made it really simple to “claim” your business or brand name in the Google Search Results Page and this is highly recommendable. Claiming your business makes it possible for you to be listed in the absolute top, whenever someone searches for your business. Here’s an example of how EasyPractice is displayed whenever someone googles EasyPractice. In the picture you’ll see I’ve marked the “Google My Business” entry with a clear red square. If we had not claimed our business name, Google would not display this. Claiming your business on Google My Business however adds a set of options for when people search for your business. Address + phone number will be displayed. 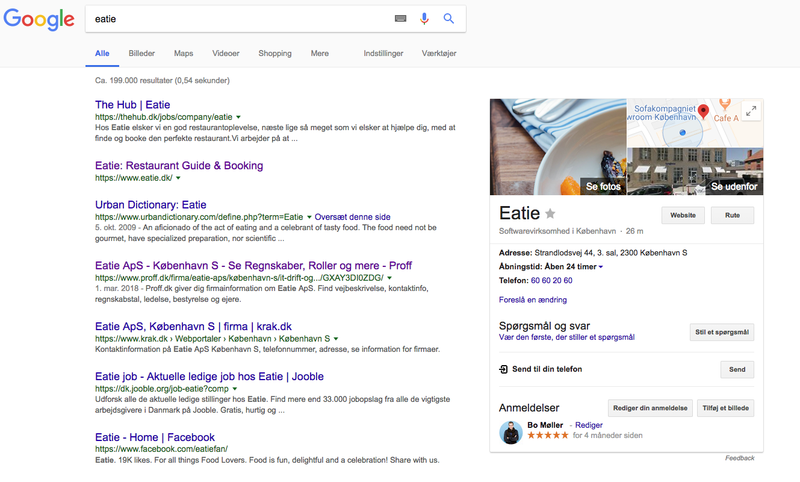 Here’s and example from the Danish “Find a restaurant in Denmark” site eatie.io. A simple search on the term “Eatie” makes Google display quite a big area with information about the company, Eatie. Have you claimed your business on google yet? If not – please go to google.com/business/ and do so. This will improve your listing on google. This goes for therapists, clinics, restaurants, apps and all other business owners but it’s in particular helpful for anyone running a “local business” as it makes it easier for anyone to find your address. As always, you can e-mail us on support@easypractice.net if you need any help.